color by Don Greer, illustrated by Andrew Probert and Richard Hudson. Squadron Signal publications has come through with another of their In Action series for the modeler. This one covers the prewar heavy cruisers of the Pensacola, Northampton, Portland, and new Orleans class. I'm sure that we will soon see a sequel to this book covering the Wichita and Baltimore class soon. The cover art by Don Greer shows the USS San Francisco In Action at Guadalcanal in the Third Battle of Savo Island that occurred Friday the 13th 1942. As with their other books this one is filled with photo's and drawings that will help the modeler by showing the ships in their various appearances. 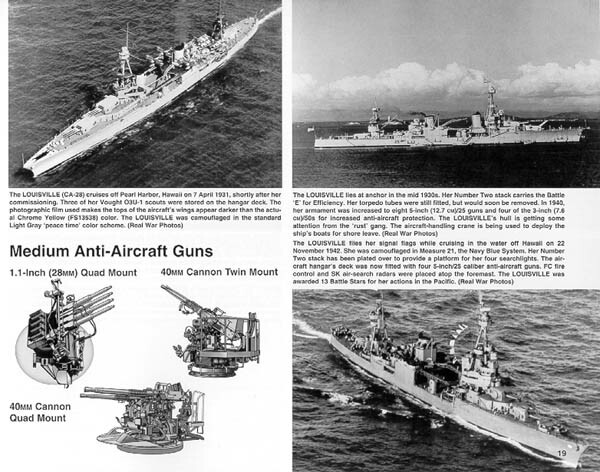 There are many line drawing that show the differences in the classes of heavy cruisers in this book. 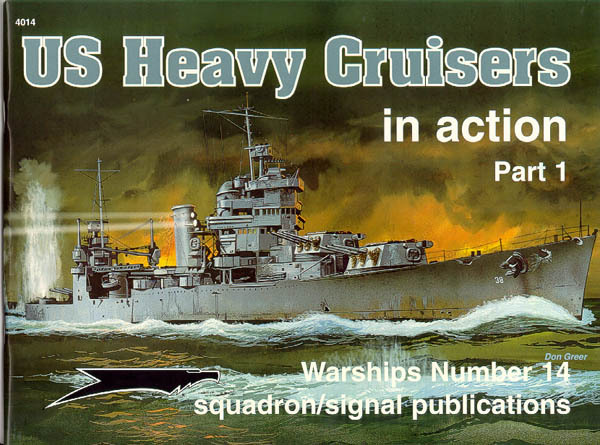 There are several pages devoted to the development of the armored cruiser, with a history of the cruisers featured in this book. In addition to the photo's you will find many 3 Dimensional weapons drawings that show everything form the light anti aircraft guns to the main gun turrets. The illustrations are now shaded, making it easier to discern the shape of the details. However the 50 cal. drawing is incomplete and doesn't show all parts. Also in several places a CXAM-1 radar is called CXAM, or even CX. There is a big difference between the two, and there was no "CX" radar. My favorite feature of the "In Action" books are the great centerfolds that show colored elevation drawings of some of the ships. 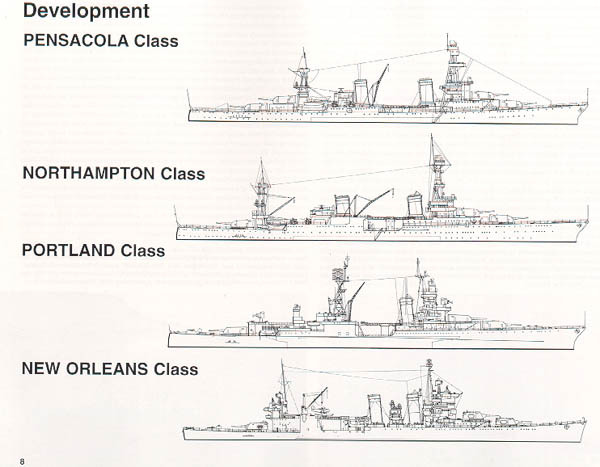 The differences in three of the New Orleans class cruiser can be made out in the illustration on the right. 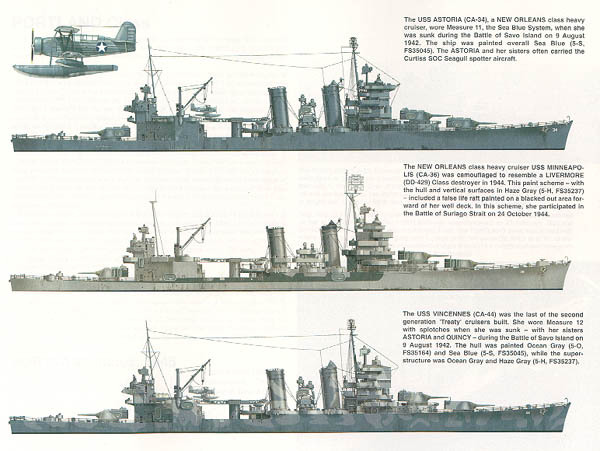 Also included, but not shown here, is the Pensacola in MS 32, (port side with a starboard half size view), the Northampton with that distinctive bow wave, and the Augusta in the rare MS 17 Scheme. On page #28 the correct camouflage measure is MS 11 not MS 21, same thing with the lower photo on page #39. 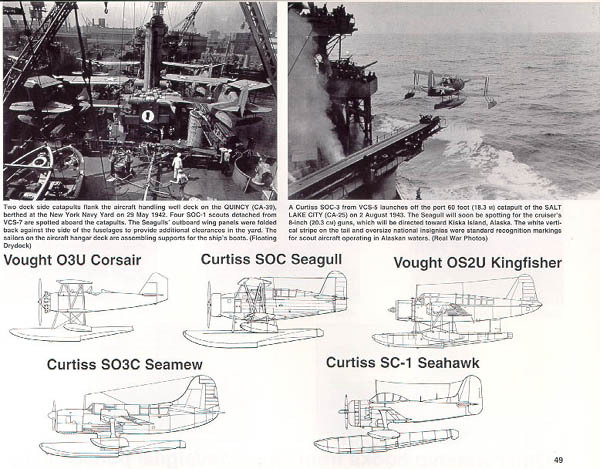 Lastly the seaplanes that operated are documented, photographically and in line drawings of each type. I'm not sure that the Seamew ever operated on any of these cruisers, but it is included as well. There are a number of errors that have crept into this book, so I would not take it as the absolute authority, but it is a good starting point to arouse your curiosity. There are about 130 illustrations in this 50 page 8-1/4" x 11" soft cover book, with a retail price of $9.95. Special thanks to Squadron Mail Order for providing the sample for review. Don't forget to check out the new look of their website, with online search and a shopping cart for your convenience.